So, you have water uncontrollably seeping into your basement, or you live on a hillside and nature has moved your front walk 30 feet downslope. If your understanding of geologic processes is limited and you do not know the cause of the problem or the financial investment required for repairs, situations like these can be frustrating. Professional help to solve the problem is needed, who do you call? For situations similar to those described above, contact the public works department (engineering, planning, or development services division) of your city or county. The problem may be one these agencies can repair. If the city or county cannot help you, a geotechnical consultant or consulting firm should be contacted. Many are listed in the telephone book under the headings “Geologists” and “Engineers-Geotechnical.” The home/property owner should contact several consultants to compare cost estimates on services. 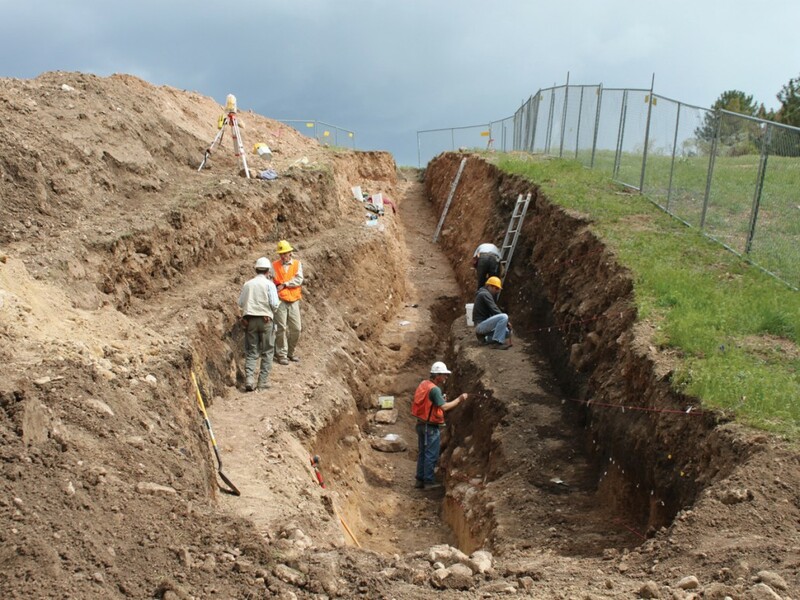 Geotechnical consulting firms have engineers and geologists who are trained to identify and mitigate geologic hazards (slope instability, shallow-ground-water, and earthquake hazards to list a few). The professional can recommend and design drainage systems for home foundations and slopes and can recommend methods to stabilize slopes and reconstruct yards. 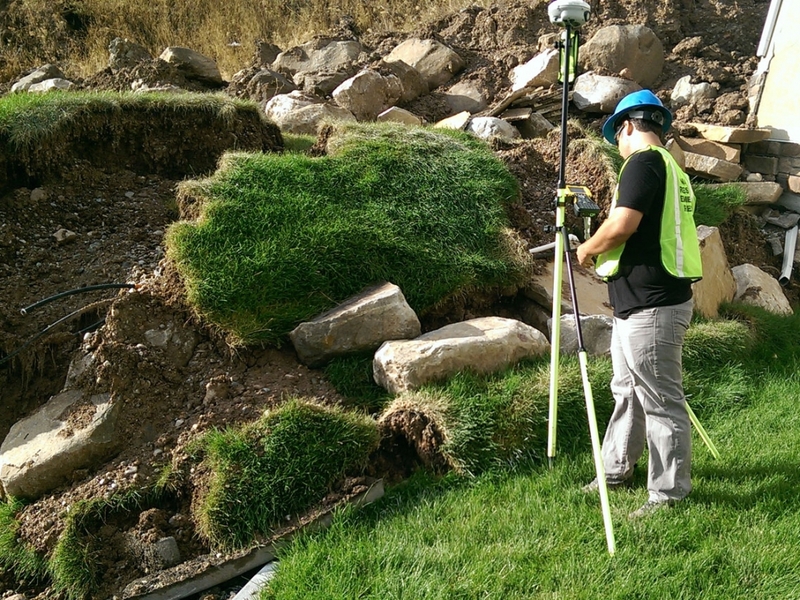 Geotechnical consultants can also determine whether or not the geologic hazard is local (your property only) or part of a larger feature with the potential to affect several pieces of property or a neighborhood. Where does the Utah Geological Survey (UGS) fit in? We respond to emergency calls if a home, property, neighborhood, or community is in life-threatening danger from a geologic hazard. In these situations, a city or county may ask the UGS to assess the hazard, and advise them on a course of action. To document and understand geologic hazards, the UGS encourages cities, counties, and the public to inform us of events when they occur so that we may investigate the hazard if warranted. 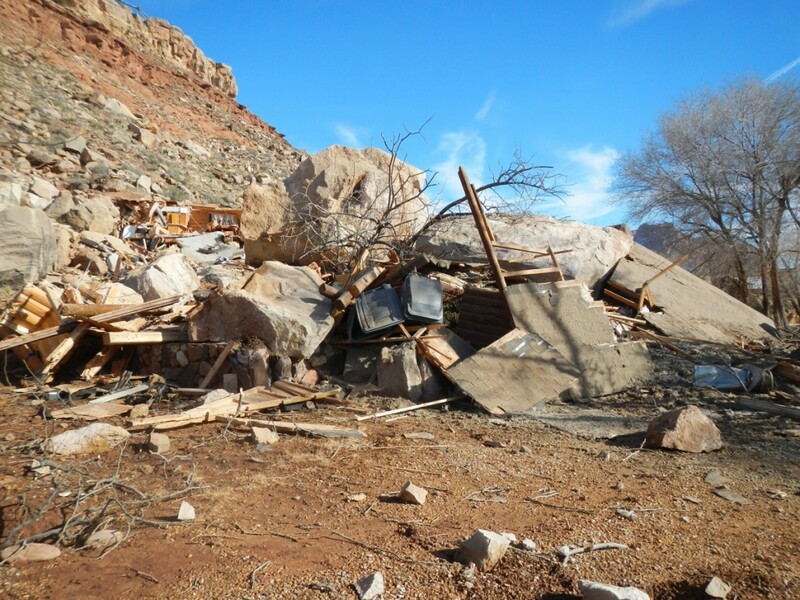 The Geologic Hazards Program of the Utah Geological Survey helps provide for public safety in Utah by assisting cities, towns, and counties in dealing with geologic hazards. 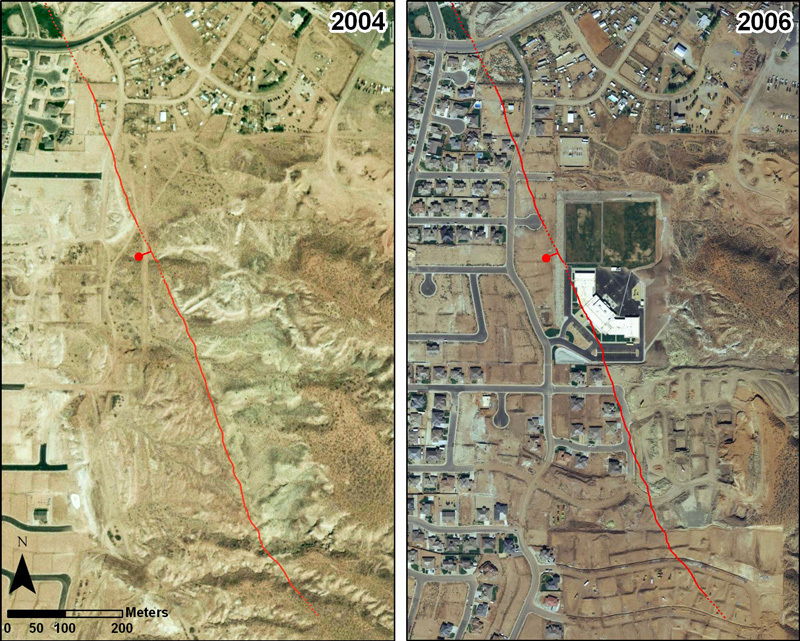 Aiding in preparing master plans and ordinances addressing geologic hazards. Preparing maps showing areas subject to geologic hazards (cooperative funding is generally required). Reviewing geologic hazards reports for essential public facilities (police and fire stations, water tanks, schools). Assess the nature and extent of the hazard. Determine the likelihood for short- and long-term recurrence. For additional information, contact Steve Bowman, Geologic Hazards Program Manager, at (801) 537-3304, fax (801) 537-3400, stevebowman@utah.gov. To ensure that proposed school building sites are investigated for potential geologic hazards, the Utah State Office of Education (USOE) recommends a preliminary site screening evaluation by the Utah Geological Survey (UGS), the preparation of detailed geologic-hazard reports by professional consultants (employing Utah licensed geologists) retained by the school district, and subsequent review of those geologic-hazard reports by the UGS. The purpose of the preliminary site screening evaluation is to identify any significant geologic hazards that should be considered in the decision making process for school-site selection. 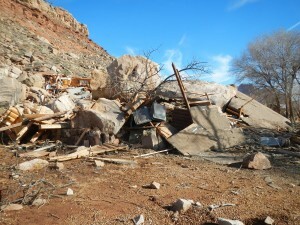 The purpose of the geologic-hazard report review is to ensure that site-specific geologic-hazard investigations are sufficiently thorough, that the report conclusions regarding any identified geologic hazards are valid, that proposed mitigation measures are reasonable, and that geologic hazards are addressed uniformly and effectively throughout the state. The on-line USOE School Building Construction and Inspection Resource Manual contains additional information related to USOE requirements for school construction. Also see the Utah State Office of Education – Geologic-Hazard Report Guidelines and Review Checklist for New Utah Public School Buildings. Rock-fall hazard above a Price area school. 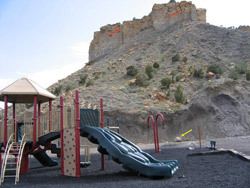 Note large rock-fall boulders on slope below cliff and a boulder (yellow arrow) that rolled down to the graded area behind the children’s play area. Cliff contains numerous tension cracks (red arrows) that could produce rock fall. During the initial school-site selection process, the UGS performs preliminary site screening evaluations prior to design and construction to identify any significant geologic hazards that should be considered in the school-site selection process. This evaluation consists of a general literature review of existing geologic information published or housed by the UGS and other information that may be available. The evaluation will be summarized in a report that typically identifies the potential for earthquake ground shaking, surface fault rupture, liquefaction, tectonic subsidence, landslides, rock fall, earthquake-induced flooding, debris flows, collapsible soils, expansive soil and/or rock, erodible soils and/or rock, shallow ground water and/or bedrock, flooding (such as from streams, lakes, canals, and/or dam failures), karst conditions, wind-blown sand, and indoor radon. A site visit is typically not required, except for unusual site conditions, or upon request. To request a preliminary school-site screening evaluation, contact the UGS School-Site Review Coordinator (see below) for your particular site location. 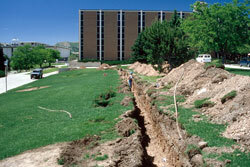 1998 fault trench for the proposed C. Roland Christensen Center on the University of Utah campus as part of a predesign and construction fault investigation project by a local engineering consultant. The preliminary school-site screening evaluation report should be used during the school-site selection process to determine if any significant geologic hazards may be present at a particular site, and if so, to help determine if the geologic hazards can be properly and cost-effectively mitigated during design and construction. The evaluation report should also be provided to the design team, including the project geotechnical consultant, to help guide geologic-hazard and geotechnical investigations. A Phase I Environmental Site Assessment, performed by professional environmental consultants following the ASTM E1527 standard, is also recommended to determine land-use history and other related issues at a particular site. Once a preliminary school-site screening evaluation has been performed and a school-site selected, a geologic-hazard report should be prepared by a professional consultant licensed in Utah. This report may be combined with a geotechnical report, but at a minimum, must include the information detailed in the geologic-hazard report guidelines. 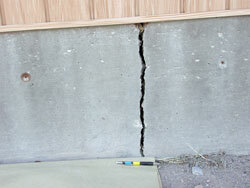 Example of foundation damage resulting from unmitigated collapsible subgrade soils. Unmitigated problem soils, such as collapsible, compressible, and expansive soils can lead to excessive differential movement of foundations, resulting in high building maintenance and repair costs. Report guidelines and review checklist have been prepared to assist in the preparation of geologic-hazard reports for new Utah public school buildings, to facilitate the review of those reports by the UGS, and to provide feedback related to geologic hazards to school-site development consultants. The guidelines and checklist also contain information on geologic-hazard data sources, a list of references cited, and a brief geologic-hazard glossary. The UGS will review geologic-hazard reports from a geologic perspective; however, if hazard evaluation or risk reduction measures include engineering analyses, design, and/or recommendations, a Utah-licensed Professional Engineer specializing in geotechnical engineering must review them. To request a geologic-hazard report review, contact the UGS School-Site Review Coordinator (see below) for your particular site location. 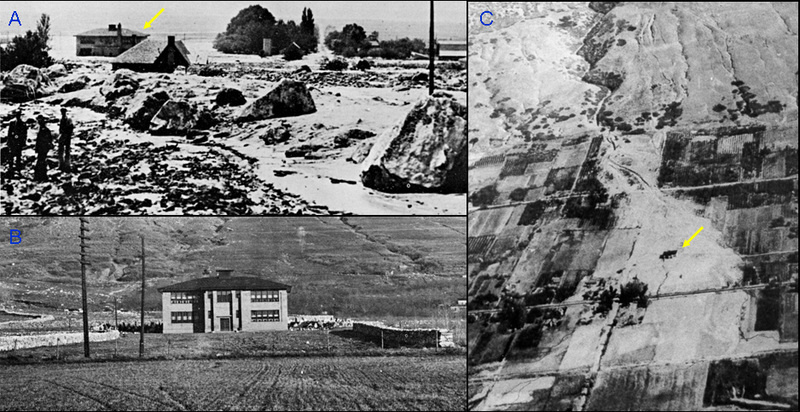 Damage to Centerville School in Centerville, Utah from a debris flow on August 11, 1930 flowing down Parrish Creek. Yellow arrows denote school building. Photo credit USDA-Forest Service. During the review process, the UGS School-Site Review Coordinator will review each submitted geologic-hazard report for pertinent information related to 16 items associated with the project and geologic hazards as indicated on the checklist, determine if the report adequately addresses each item, and provide brief comments on the item, if needed.